Recently Adobe released a new SDK called Adobe Flash Access, formerly called FMRMS (Flash Media Rights Management Server). It is an SDK written in Java that aims to give developers the ability to protect and monetize their video applications based on Flash Platform, mainly the distribution of content via streaming and can work with Adobe Flash Media Server. Flash Access is able to adapt various business models. including video on demand, renting and selling by electronic means. Companies can also use Flash Access to protect the integrity and privacy of their training or advertisements provided through video. 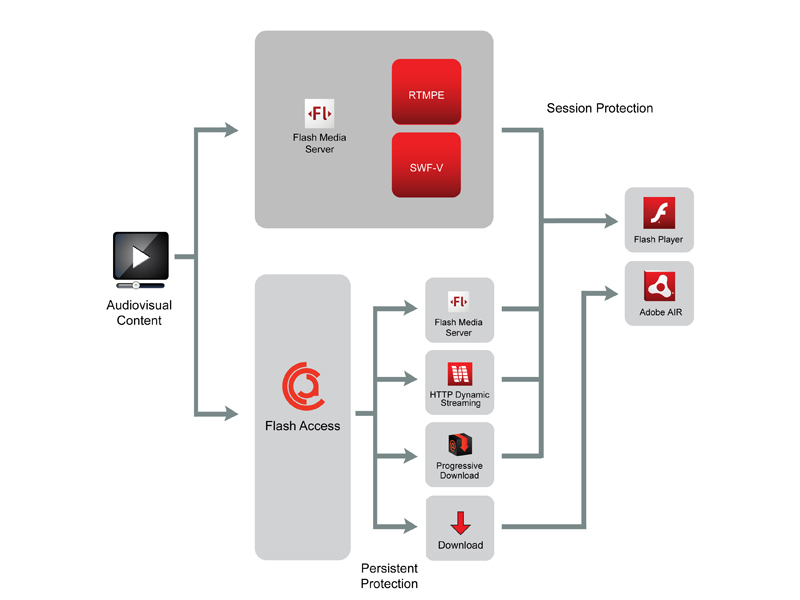 You can distribute protected content access with Flash streaming through Adobe Flash Media Server, the new Dynamic HTTP streaming, progressive download, or allow downloads from a library of content for playback on local consumer convenience. Hi, would you say that Flash Access 2.0 is the best way to protect “download to own” video content?